Please contact the Center of Competence PROFIL hp to receive your personal access codes. Before you start to complete the online test make sure to have ample time to work undisturbed and without being interrupted for approx. 20 to 30 minutes. There is no time limit. 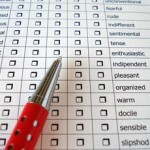 The questionnaire consists of two parts. Please read the instructions carefully.